Desert Mountain real estate Scottsdale Arizona is a multi-gated resort community with guarded gates that enhances security for its members. This 8,000-acre luxury community is located in far North Scottsdale on the border of Carefree and the Tonto National Forest and nestled at the base of Apache Peak. With elevation ranging from 2,400 to 4,500 feet above sea level, Desert Mountain enjoys clean crisp air and immaculate lands. Desert Mountain offers 6 Jack Nicklaus Signature Golf Courses and Clubhouses, world-class, swim and fitness centers, award-winning golf-pro shops, the Sonoran Fitness Center & Spa, tennis facilities that includes hard compression, grass & clay courts, plus fine dining facilities and more. They offer 2375 Equity Golf Memberships, which translates to less than 396 such memberships per course across all six courses. The Equity Golf Membership to the Desert Mountain Club is currently $140,000. Many of the homes sold in this community will include this membership with the sale of the home. Desert Mountain was named as one of the top 25 golf communities by Luxury Golf & Travel magazine and the Renegade course was named as one of America’s top 50 toughest courses by Golf Digest magazine in 2007. These are just two of the dozens of award and recognition that Desert Mountain has received. 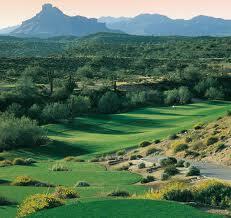 Desert Mountain members have the most extensive golf practice facilities in Arizona. There are multiple pitching, chipping, putting and bunker areas, and four separate practice ranges with target greens. Desert Mountain’s PGA-trained professionals are available to help members at any skill level. Its Member Services presents the finest concierge services that equals to five-star hotels worldwide. This award-winning community clearly defines casual southwestern luxury living. The children have not been forgotten as Desert Mountain is family-friendly, with a full calendar of children’s activities. If you like to hike there is over 9 miles of hiking trails within the community. For inquiries on Desert Mountain real estate Scottsdale, Arizona just Email or call us at 480-595-6412.